QRPer is a personal website administered by me, Tom Witherspoon – K4SWL. I created the site in order to have a fun, dynamic space to connect some of my favorite external QRP web sites. There are a lot of QRP websites on the internet–some with amazing content–and I especially like those sites that give first-hand accounts of QRPers, in the field or at home, using their QRP equipment. The goal of my site is to promote all things QRP–especially articles and sites which celebrate QRP in action. More specifically, my site will focus on portable operations. Something I love to read about is how an innovative radio operator has created a portable grab-and-go set up for their QRP station. Each time I contemplate purchasing a new QRP radio, I scour the internet for sites where people have created such a set-up. My hope is that QRPer.com will receive enough support that people will actually submit photos and descriptions of their own grab-and-go set-ups. With this attention to portability, you will also notice that I post a lot of articles related to small radio kits and accesories. Perhaps the unique thing about QRP radios and accesories is that, by and large, they are manufactured by “Mom and Pop” organizations. Indeed, many are designed and manufactured by QRP clubs and members. When you buy QRP equipment, you are supporting QRPers and their innovations–a grassroots R&D method that seems to be working for the QRP community very well. I was first licensed as KC8GLI in 1997 while living in Athens, OH. A couple of years later, I upgraded my license to a General Class while living in North Carolina and my call changed to KF4TZK. After learning CW, I realized that KF4TZK was a fist full, so I changed my call to K4SWL to reflect my other passion for shortwave radio. In 2000, I moved to the UK for 3 years and held the call M0CYI. Working in IT for Corning, Inc., I traveled extensively throughout Europe though I had very little time to play radio. As an expatriate, my work kept me quite busy. I took a career change in late 2002 and worked on my MSc. in Social Anthropology (of Religion and Economics) from the London School of Economics. I did find some time to attend a few ham radio club meetings with the Dorking Amateur Radio Club–what a great set of guys! After my wife and I moved back to Asheville, NC, I started playing radio again and realized quickly how much I had missed it. Since then, I have been very radio active! It was the promise and challenge of operating QRP that really energized me to get my ticket in 1997. I remember being hooked the moment one of my Elmers told me about an HF transceiver that was so small it could fit in an Altoids tin–and about how it was challenging, yet very possible to work DX with it. My continued interest in QRP probably also has a lot to do with the fact that, very early on, I became a member of the Southeast Ohio Radio Adventure Team (SEORATs–or, “Rats”)–a group of hams who enjoy operating QRP in the field. There is nothing I like more than taking a rig outside and working a QRP contest. This ads a whole new dimension to the radio hobby and, best of all, prepares you for emergencies. Even though I live in North Carolina, I still keep in touch with my fellow Rats through QRP CW scheds each week and I usually make it to at least one SEORAT field event each year. So what’s in the shack? My radio philosophy is, “less is more.” I focus on obtaining fewer pieces of high quality radio equipment rather than purchasing (and not using) a lot of redundant, lower quality radios. This is a convenient philosophy since my radio budget is limited! Ten-Tec OMNI VI+ — this is my main HF rig and I absolutely love it. It has a very low noise floor, very sensitive receiver, is incredible at handling QRM and has silky smooth QSK. Yes, though it’s capable of 125 watts PEP, I keep its power turned down to QRP levels most of the time, and yes, I’m willing to take this monster to the field! 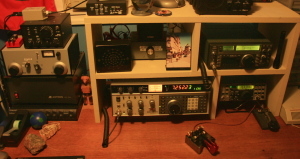 Elecraft KX3 — in January 2013, I purchased a factory-built KX3. I bought this radio to use for QRP field contests and as a back-up radio for the shack. Like my OMNI VI+, the KX3 has a very low noise floor and great general coverage receiver. Elecraft KX1 — I purchased this tiny, CW-only, 4 band field transceiver specifically for backpack use. Out of all of my radios, this one is the most fun to operate. I have taken it on many trips, visits to parks, vacations and have even operated it from my livingroom couch with a couple of 26′ wires. It’s incredibly small, and since its controls are mounted on top of the radio, it’s very easy to operate while standing or with the rig in your lap. It operates on 80, 40, 30 and 20 meters and its internal ATU is designed specifically to handle end fed random length radiators and counterpoises. The KX1 is a very capable CW machine and, in my experience, out performs many of its pricier QRP portable competitors. I am currently directing a project called “Ears To Our World”–a humanitarian effort to distribute self-powered shortwave radios to rural classrooms in the developing world. If you would like to help with this effort, please contact me. Click here to view the Ears To Our World website. Another important hobby to me is Shortwave Radio listening. I operate a popular educational website called SWLing. The site is specifically designed for the newcomer to SWLing–my hope is that it will encourage parents to teach their children about the world of international broadcasting. Based on the feedback I have received, it seems to be working! Click here to view the SWLing website. Again, this is a personal website and I can certainly use your help to make QRPer better for everyone. If you have any suggestions for links, or if you would like to write an article for QRPer, please don’t hesitate to contact me through the Contact page.